Включает возможность сохранения таймеров для быстрого доступа, настраиваемых цветов и звука, полноэкранного режима и возможности одновременного запуска нескольких таймеров. 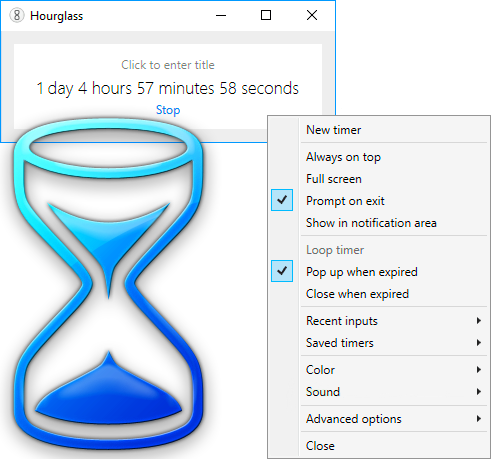 Hourglass is a simply countdown time that uses a unique concept to quickly create a new timing task by simply typing the desired countdown date or time into the small interface and pressing Enter to start the timer. Type a duration like 5 minutes or a date and time like August 11 at 8 pm to start your timer. Once the countdown reaches 0, the program can optionally alert you with a sound or popup window. Hourglass is designed to accept most common time and date formats, you can simply enter “5″ to start a 5 minute countdown or use “120s” to countdown 120 seconds or type “5:00″ to be notified at 5.00 PM . You can even type a future date (e.g 12/31/2016) to start a countdown to that day. Other features include and option to save timers for quick access, customizable colors and sound, full-screen mode and the ability to run multiple timers simultaneously.